How much of our good fortune is pure luck — moments over which we have no control? On the flip side, how much of our luck do we make ourselves, by preparing appropriately and seizing opportunities as they come? That’s what John Scannell, chairman and chief executive officer of Moog, explored in his opening remarks this spring as part of the Leaders on Leadership Speakers Series, hosted by the University at Buffalo School of Management’s Center for Leadership and Organizational Effectiveness. From there, Scannell made his own luck, taking risks to grow as a leader. 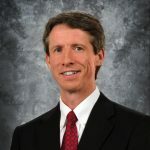 In 1990, he joined Moog, a public company that designs and manufactures products for the aerospace, automotive, defense, energy and medical device industries. Since then, he’s moved from Ireland to Germany and back again, finally relocating to the United States in 2003 to serve as the Boeing 787 program manager at Moog. He was named chief financial officer in 2007 and promoted to president and chief operating officer in 2010. Today, as chairman and CEO, he leads an organization well-known for its innovative, creative and employee-focused company culture. The following is an excerpt of Scannell’s leadership advice from his UB presentation. “Make a plan. We talk about strategy in business, but strategy for life is also a good way to find out what you really want to achieve. Although it wasn’t planned, I did this step back in 2002 when I was presented with an opportunity to come to the U.S. We were living in Ireland, faced with that possibility, and I ended up on a long flight and wrote a letter to my wife that said, ‘Here are all the things I hope will happen if we do this’ — kind of a set of broad objectives. This entry was posted in Leadership and tagged leadership, leading, luck by UB School of Management. Bookmark the permalink.